Welcome to Norris Ferry Community Church where you will discover a warm group of real people dedicated to following our Lord and Savior, Jesus Christ. You will find that we exist to glorify God by loving Christ, Christians, Neighbors, and Nations. We are glad you are interested in visiting our church. We are a church centered around authentic community for the purpose of growing in our love of Christ, Christians, Neighbors, and Nations. We hope you join us on Sunday and consider making us your church family. Like all families, we are not perfect, but thankfully, we have been saved by the One who is. We invite you and your family to worship with us where you will experience dynamic worship, prayer and expository teaching that is applicable to your life. Our services start out with our worship team leading us in songs that express who Christ is in our lives. We then hear from God’s Word and learn how it impacts our lives on a daily basis. Be prepared to be challenged and encouraged. We believe in the value of family worship. So we encourage families with children of all ages to participate together in Sunday morning worship at 9am or 10:30am. We also know there is value in Kids Core Class. In our Kids Core Class, we expose children to the gospel as seen throughout Scripture, so that the spiritual foundation that they are developing is based on solid biblical truths. On Sunday mornings, these Kids Core Classes are available for children from birth through 5th grade at 9am, and children from birth through 3rd grade at 10:30am. Click Here to learn more about what is available for kids. For Students 6th grade-12th grade we offer a core class on Sunday mornings at 9am. This class is walking through the whole bible in three years! During the 10:30am service we would love for all students to worship and hear God's word taught with their families in the main service. Click Here to learn about what is available for students. 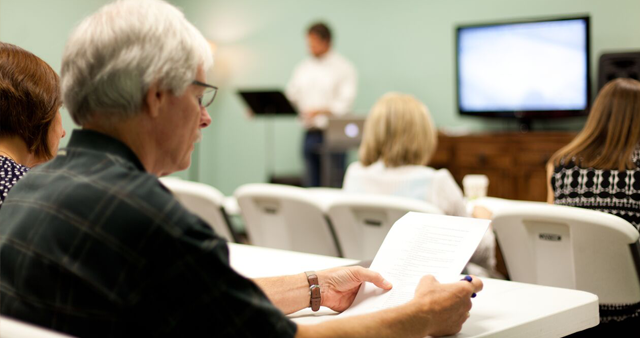 We offer two adult core classes during our 9am service and the 10:30am service. Both classes are walking through the whole bible in three years! We would love for you to join us as we study God's Word together. Click here to learn more about the Adult Ministries.